The Wall Street Journal recently printed the article, The Real Drug Problem: Forgetting to Take Them. The article reported the World Health Organization has found only 50% of people typically follow their doctors orders for taking medications. Why aren't people taking their medications correctly? There are many reasons including forgetting, not getting the instructions right, not wanting to take them, and the cost of medication. Below are some hints to help you get the most out of your medications. 1) Have a correct list of your medications (if you have several prescribing doctors then you will need to verify the medication instructions with each). 2) Use the same pharmacy for all of your medications. The pharmacist can then watch for possible drug interactions. 4) Drink a full glass of water when taking medications to make sure they don't lodge in the throat and cause damage. The fluid will also help with absorption. 5) Take medications at the proper time. Follow the directions from your pharmacist, write them down, if necessary. 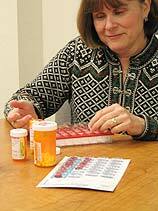 6) Use a pill box (mediset) to organize your medications and follow a routine. 7) Throw away all medications that have expired, because they can become toxic. 8) Check with your doctor before you stop taking any medication-even if you are feeling better. 1. Lock medicines out of reach and sight of your loved one with dementia. 2. Treat non-prescription and prescription medication with equal caution.3. Most poisonings occur when the product is in use. Never leave a loved one with dementia alone with the medication. 4. Keep the National Poison Hotline (800-222-1222) by every phone in the home.